To acknowledge the efforts of the men and women of plants which were providing the material needed, the government created a production award system. During World War II more that 4,000 "E Pennants" were presented to war plants in recognition of production excellence. The famous flag with the big "E" emblazoned on it became a badge of patriotism in action. Awarded on a plant rather than a company basis, the award consisted of a flag to be flown over the plant and a lapel pin for every employee within the plant. John Heddon developed the steel golf club division in 1931 moving onto steel ski poles then steel bait and fly rods. They were manufactured with John Heddon's exclusive patented process for tapering steel tubing and tempering the steel with a heat treat operation. 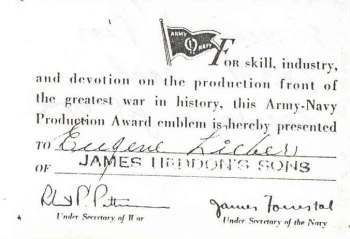 It was because of their capability for tapering and heat-treating steel tubing that James Heddon's Sons were able to secure its first war contract. They made aerial mast's and antennas for the signal corps and other restricted radio communication equipment for military vehicles. They also made a fold up box kite which was used with emergency communications equipment for pilots that were shot down. 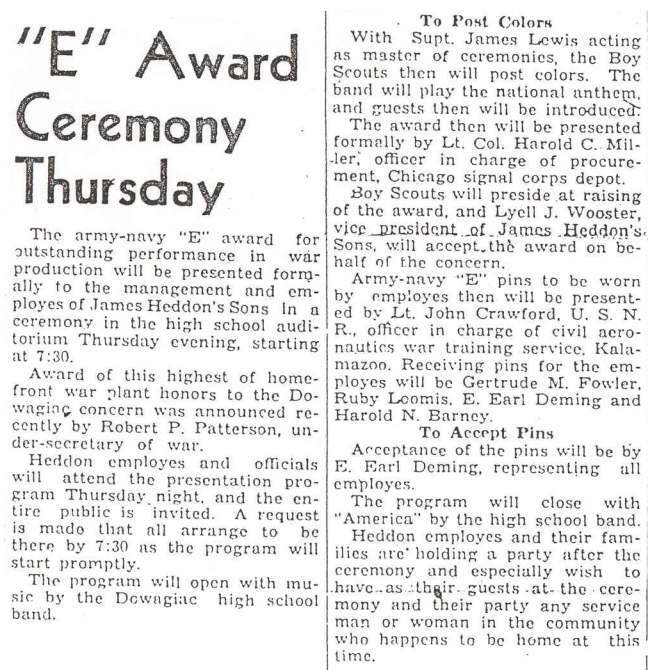 The Presentation of the Army - Navy Production Award to the James Heddon's Sons Dowagiac factory was held at the Dowagiac High School on Thursday, March 30, 1944. The above photograph was probably taken the afternoon before the ceremony at the James Heddon's Sons factory. 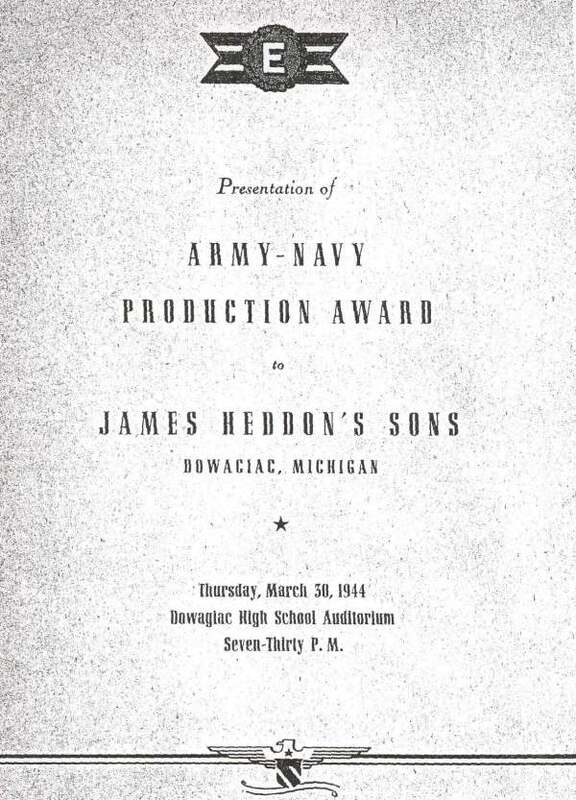 This is the brochure cover of the Production Award Ceremony that was held at the Dowagiac High School on March 30, 1944 . Anyone attending the ceremony was given a brochure. Over 500 workers, family members and friends attend this ceremony. The pennant and emblems were presented to Heddon's management and employee's by Lt. Col. Harold C. Miller (Army) and Lt. John Crawford (Navy). Earl Deming accepted the pins on behalf of the employee's. Every employee of the James Heddon's Sons Plant in Dowagiac, Michigan received an E-pin and a personalized pin card. After the war Heddon started producing fishing tackle again along with other items such as golf clubs. 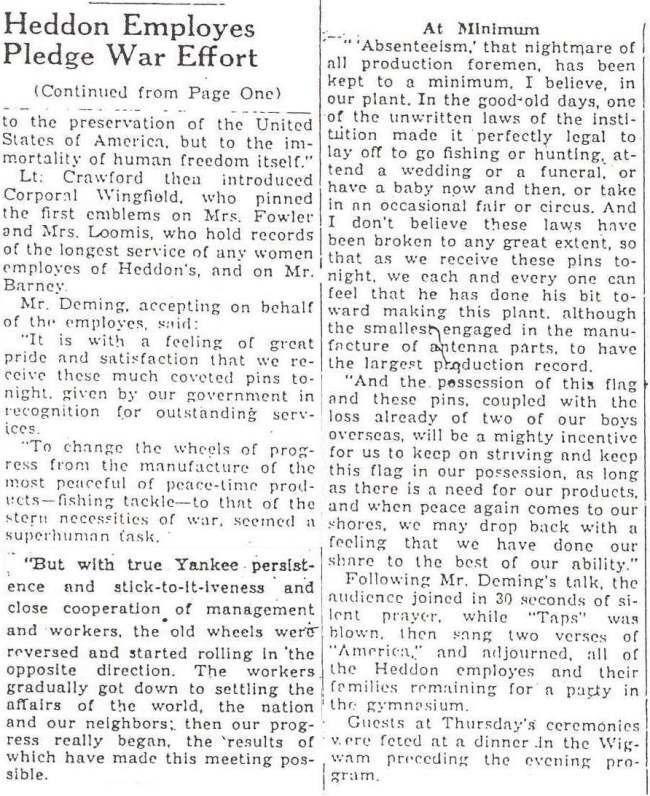 They only offered limited tackle in 1946, 1947 & 1948 but in 1949 the Heddon catalog offered a full line of fishing tackle and in 1950 they reached full production and offered many new items. 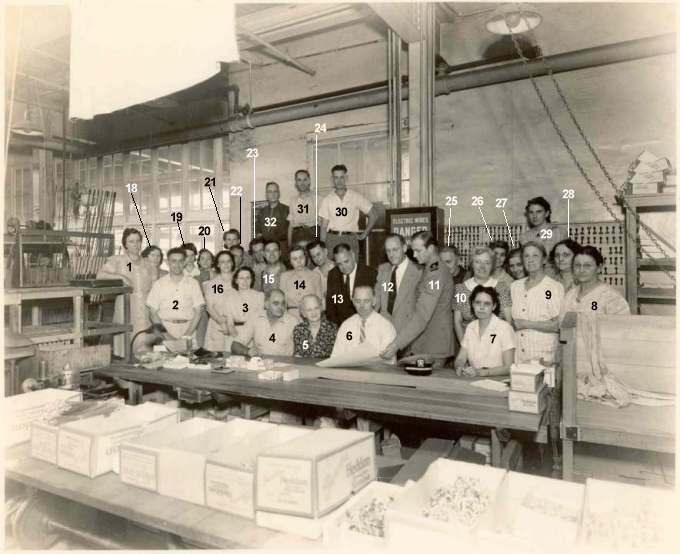 Can You Identify these 1944 Heddon Employee's ? After studying this photograph under a magnifying glass I was able to identify many of the tackle related objects in this room. There are many Genuine Heddon Dowagiac Minnow cartons on the front table piled full of baits and more cartons in various area's of the room There are also Genuine Heddon River Runt Spook cartons on the shelf underneath the table and H. R. Brush box's on the table top. From the newspaper article we know that Heddon had not produced any fishing tackle 18 months prior from when this photograph was taken. Therefore all the fishing items in this photograph must date back to October of 1942. My sincere thanks to Mr. Clyde. A. Harbin Sr., The Bassman, and Mr. Lanny West, Senior Director of Marketing and International Sales of PRADCO Outdoor Brands for their help and support in getting this Heddon Factory photograph identified. A special thanks to Mrs. Joan Lyons, owner of the Heddon Museum in Dowagiac, Michigan for identifying my Heddon photograph and sending me the 1944 Dowagiac Daily News articles, ceremony brochure cover and employee pin card. I knew nothing of the Heddon Production Award until she sent me this information and made me aware of this event. Joan also identified fourteen of the Heddon employee's in the photograph. I have since donated this Heddon Factory Production Award photograph to the Heddon Museum in Dowagiac, Michigan for the public to enjoy and see this bit of Heddon history.